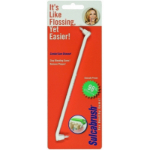 Rubber tip stimulator for gingival massage and interdental cleaning. Professionally designed to promote healthy firm gums. Slender angled neck for better control.